A few of the photos were taken without using a tripod, the majority were taken on a tripod, shot with an older NIKON coolpix 995 without any lens attachments. 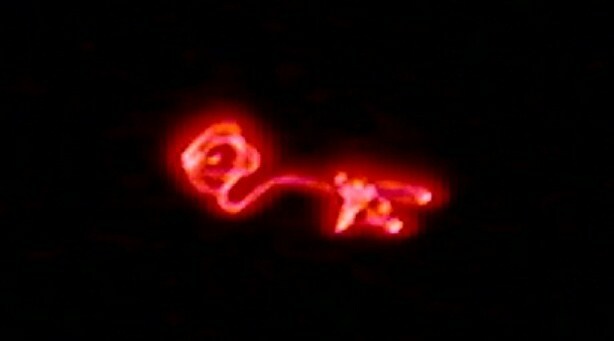 I noticed the UFO on the night of Dec after parking in the street in front of my house. The UFO was to the east of my 29th street residence….about 50-60 degrees up in the sky. A few months earlier in Oct. I viewed a red light that appeared to be exact to what I saw in Dec in generally the same area but to the south a few blocks. In 1987-88 I saw pretty much a very similiar red light as a kid in McCall Idaho….in that event the light shot across a small valley and stopped around 30 feet in the air above a tree in our front yard and appeared to be a ball of energy spinning and changing colors at a high rate that then shot into the air and split into two changing bright white. When I blow up the photos I took of the Dec 2011 UFO, a few of the blow ups appear to be very similiar to what I looked at up close with the naked eye years earlier a hundred miles north of Boise. 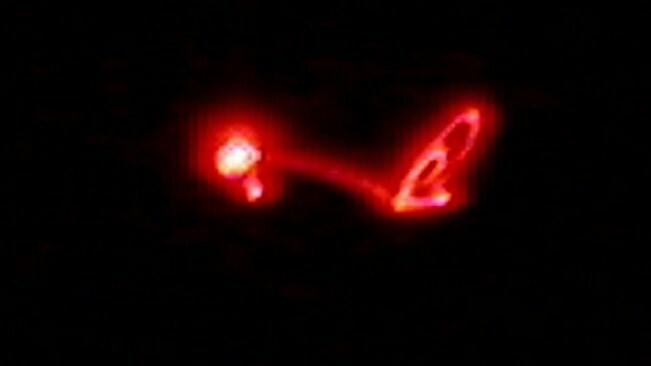 The UFO in the photos was stationary most of the time, with no detectable noise, and was pulsing in intensity, sometimes seeming regularly, and other times seeming irregular. My wife got the impression that it was “scanning” the ground below and that appeared to us to be changing in intensity. While I was scrambling for the camera, a friend a few blocks over I called witnessed a flourescent white tube looking extension form for a few seconds off of this red pulsating light. That same person a few blocks over called his father 3-4 miles to the west of us, and who also lives up a few hundred feet higher than our location, on a bench. His father reported the light was strong, and up above the horizon which leads me to believe that the light was higher than 200-400 feet at least. My guess, a thousand or so. At one point, the light did move dramatically as far as movement in that it was so smooth and consistent, it did not move incredible fast. It seemed to stop pulsating in my recollection while moving. It stopped nearly above our area, but a little to the north….it hovered for a few minutes maybe, if that, and then took the similiar path back to around where I originally first saw it. I watched for around 35 minutes, and then the light appeared to shrink in size, or move directly back away from my viewpoint, or both, and then started strobing faster and faster and completely dark to light and then after a session of quick frequency increasing strobing just turned off or vanished. I did notsee any smoke against the night sky where it had been and that was it. end of show. There are commercial/police drones in Boise being used. but local papers explain the commercial/police drones sound like commercial blenders, quite powerful and loud. When looking at photos here blown up, I have the idea that this is some sort of contained/concentrated plasma phenomenon. One photo seems to have a formation of a type of “eye” formation and has a roughly cubic/ geometric looking cellular formation in some photos, and areas regular dimpling effect, as if a grid of energy is feeding the ball of light. Some of the photos look irregular and boxy shaped… don’t know if this is just camera artifact, possibly high rate of spin and changing formation, or what. Its a once in a lifetime achievement for me to finally get photos of these strange red lights seen in Idaho, of which, is the bulk of my UFO experiences. There were around 8 other witnesses to the event that I know, and as this happened above Boise’s north end neighborhoods, I am keeping my eye open for other photos. Hopefully some day we can collaberate some rough triangulation of the event. There are reports in Boise around the same time of year, and in neighboring states I noticed like OR or WA, that appear to possibly be related in color or intensity. 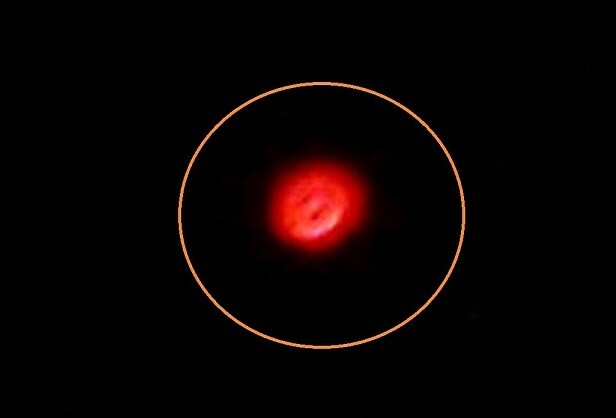 One report in Boise a day or so around the 24th of dec saw a red orb breaking in two and then rejoining. I would love to hear a physics buff comment on the seeming formations that this ball of light seems to take shape and also when the images are manipulated, it appears that some sort of energy feild extends from the ball of light, if that is true or not I do not know, as camera artifact/play of light might comes into question as well. This story and photos was sent to World UFO Photos by Cliff Green, witness and photographer.